A collection of stories documenting the people, places & adventures that occurred during the 2 years making “South To Sian”. 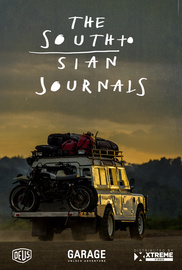 A collection of stories documenting the people, places & adventures that occurred during the 2 years making “South To Sian” - the challenges, the surfers, riders, shapers, bike builders, filmmakers and photographers. Extremely entertaining and insightful, “Journals” documents the travels, the hardships, the spectacular locations, the personalities and the thoughts of the characters, both in front of and behind the lens.